More than any other studio and undoubtedly because they were the earliest pioneers in the realm of mainstream animation, the House of Mouse is perhaps most frequently associated with extraordinarily vivid visuals. And since their most beloved “pictures” were likewise comprised of “pictures,” it's only fitting that if someone were to ask you the first few things that entered your mind when you heard the name “Walt Disney,” your reactions would surely consist of the studio's unforgettable imagery. Yet while the ears of their lovable icon Mickey Mouse, the logo of the elegant castle which is illuminated by Tinker Bell's wand before every feature presentation, and the beautiful princesses from Snow White up through the most recent heroines may be contained in your Disney Greatest Hits List, another longtime muse for the company, which has only grown stronger over the years may not be as immediately apparent. Yet, the muse in question has routinely been man's loyal best friend in both the story and art departments of the Mouse House. We've witnessed these sidekicks in all varieties from Mickey's loyal dog Pluto defending his Christmas tree against intruders Chip and Dale, to braving sloppy Italian cuisine on a first date in Lady and the Tramp up through the Truman Show like dog in Bolt, a Beverly Hills Chihuahua lost in Mexico, or given a voice-box accessory in Up. Whether they're developing television shows about them, letting them play important supporting characters in live action works, or making them the stars in 101 Dalmatians, Walt Disney Studios has paid tribute to our four legged friends for decades and likewise mastered the art of developing doggy franchises. Moving successfully between live action and animation, Disney assumed they'd struck gold with the predictable yet heartwarming 1997 theatrical release Air Bud about a lost Golden Retriever and a lonely boy who form a basketball based friendship and eventual familial bond. 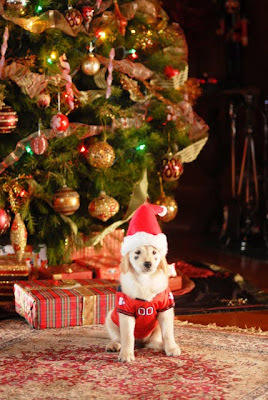 However, that gold proved to have only been silver when Disney created a direct-to-disc spinoff of the popular Bud films by introducing children to the next generation of Golden Retriever characters via the five puppies collectively known as the Buddies in 2006. And sure enough, due to the fast paced action and youth of the talking Buddies who therefore appealed to the youngest Disney fans in your household, the characters and their respective films have developed into "the most popular live-action direct-to-DVD franchise ever," thanks to titles like Air Buddies, the biggest hit to date Snow Buddies, and the early '09 release of Space Buddies. 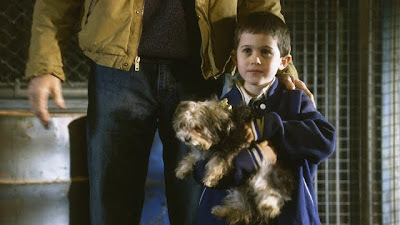 I first encountered the pups as they blasted off into space in the overblown CGI Space entry which had the grave misfortune of becoming the latest in 2008 and early 2009's bizarrely unwelcome family entertainment trend of sending animals from Earth "to infinity and beyond." Compared to their previous title Chihuahua as well as the DVD special edition releases of the Charles Dickens inspired Oliver and Company along with the original Air Bud, I found Space Buddies to be a major and tedious letdown. 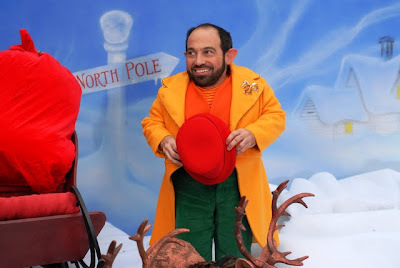 However, I'm happy to report that in this slightly Dickens inspired work Santa Buddies: The Legend of Santa Paws is lightyears better than its purely effects driven predecessor. 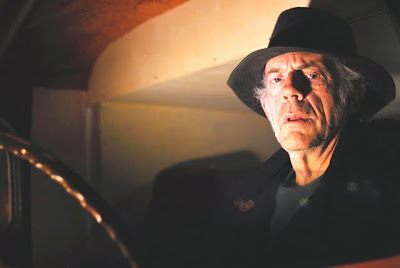 The film finds Christopher Lloyd cast in the Scrooge McDuck or veritable Scrooge role of cruel dogcatcher Stan Cruge who refuses to give a dog to the father of a sick young boy without trying to hold the cash-strapped man ransom with a $300 price-tag he can't afford. And when you realize that the rightfully free dog is named Tiny (instead of the man's son being called Tiny Tim), you see the homage to A Christmas Carol used throughout the movie that similarly adheres to the "Christmas spirit" theme as its driving force... Buddies style. In addition to Carol and perhaps for good audience success measure, Elf appears to be another influence on the film as we discover that holiday cheer is at an all-time low. Much like Will Ferrell and Zooey Deschanel's push to get Santa's sleigh off the ground with a New York sing along in Jon Favreau's delicious modern classic, a similar "power" angle is utilized in Buddies. The impact that the absence of pure belief in Christmas has on the power supply in Buddies becomes much more urgent, giving off a dangerous global warming aura as the North Pole begins to melt and the reindeer grow ill. Tired of his life in the North Pole and like Little Mermaid's Ariel who longed to be where the people are, the mischievous canine son of Santa Paws-- Puppy Paws-- rebels, defecting from the Pole to join the naughty list's Budderball to learn what it's like to be a real dog in Washington state. Although Puppy Paws is posed to be our unlikely hero as the new canine character, in this installment the one we instantly love is the scruffy and cute female Tiny. Unaccustomed to the way things work in the United States, Puppy Paws' plot consists primarily of getting the Buddies in trouble as he tricks them into thinking they can get off the naughty list by helping him out, making him nowhere near as empathetic as Space Buddies' Russian dog the Buddies met in the previous adventure. Yet, whereas Space was a film that you were ready to turn off almost as soon as it began, aside from its tendency to do a little too much preaching, Santa Buddies is a great improvement, despite the Blu-ray and DVD's sparse, identical bonus features, a surprisingly lifeless turn as Santa by a visibly bored George Wendt and of course, the B-Dawg factor. Although instinctively the sight of five adorable Golden Retrievers will soften the hardest of hearts even bearing in mind the eerie animation used to make their mouths move, I must confess that I've never been a big fan of the cardboard personalities of the Buddies themselves. Yet while it's easily forgiven in the rest, the annoying and stereotypical slang of the most irritating pup, B-Dawg grates on the nerves given his obsession with using as much "mad gnarly fun fo-shizzle," with the "tight, trippin' bling" of "my sweet pad" as the writers can squeeze into the movie. And although I understand they needed a way to separate the identical looking dogs, the one side effect that no doubt every parent or gift-buyer is hoping to avoid would be for their impressionable kids to begin emulating the urban stereotypical caricature of B-Dawg in their speech which is bound to happen. 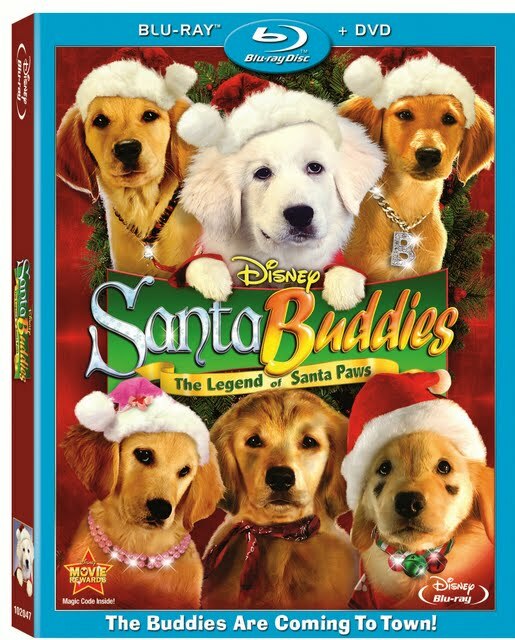 However, aside from the grammar nightmare that is B-Dawg, Santa Buddies succeeds everywhere that Space Buddies did not as the stellar production values evidenced in the extremely vivid Blu-ray transfer offers a more believable balance between CGI and authentic locations from start to finish. Bolstered by the superb technical Blu-ray quality of this Combo Pack which also includes the standard DVD, the positive message of the movie easily wins you over in what is ultimately an entertaining if admittedly unoriginal but benign rehash of several Christmas movies. Still, all in all, this is another great example of a Disney dog picture that is fortunately more of a "buddy" than a "dog." FTC Disclosure: This critic is not for sale. I do not accept gifts, money, paid travel, or any merchandise with the sole exception of precisely what it is that I am reviewing. Or in the case of this title from WDSHE: Buddy not included (whether in the form of a stuffed animal or a puppy for Christmas). Like all of the other pieces on Film Intuition, LLC, this is not a paid review. However, as is the case with critics employed in the field of journalism, I was provided with a copy of the film for review purposes, which has no bearing on whether it receives a positive, negative or mixed evaluation... as witnessed above.